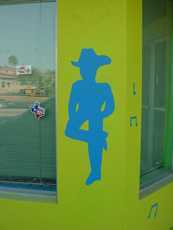 The Anatomically Incorrect Cowboy Silhouette. "Friends don't let friends paint murals." No matter how many times we hear it on public service announcements, every year there is a bumper crop of deformed, melon-headed, leering, spatulate-fingered, bug-eyed "people" who look like medical curiousities. We spoted this couple in Three Rivers just opposite the park in the town square. The artist, who neglected to sign his work, has pretty good control and actually draws a nice straight line for someone who might be color blind. We assume that the figures were drawn from memory - and not from life. Actually we pray that the figures were drawn from the artist's memory - and not from life. Despite the musical notes swimming all around him, the cowboy seems to prefer watching than participating in the merriment. He may also be thinking about the accident and the surgery that removed about eight inches of his torso. Unable to contain herself, the female of the pair (who may have been altered in the same accident) is shown dancing. While breaking the law of gravity is usually a misdemeanor, in this case it just might be a felony. Seen any bar art or painted advertising that you would like to share with our readers? Please contact us.